Have you any idea which Google update has affected or damages your rankings? Follow these SEO Tips because Google Panda & Penguin are very different and what you need to do to fix your rankings is very different. Large traffic drops on or near the 24th April 2012 indicate that Penguin has penalized your linking profile. 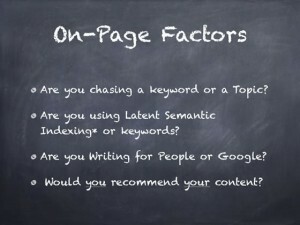 Google Penguin also demotes the phrases most used in your back-link anchor text. The free back-link analysis tool at majesticseo.com will show you the most popular phrases being used in your back-links. Keyword text density requirements dropped overnight and today you need the maximum for any keyword to be 5% or lower. Change the bulk of the keyword rich links for either Brand based links, URL variation links or ‘junk’ links in several permutations. Brand links are variations of either your registered company name or website name. Use different types of website addresses for your URL link creation. Getting links from various IP addresses is very important for good rankings. It is more valuable than ever that your links come from relevant sites instead of random content sites. The sites that link to sites linking to you are measured by Google, for this reason, look for a good ‘trust’ score for your back-link building. Where possible try to find website pages that will link to you that have already got ‘authority’ backlinks pointing to them. There is no such thing as a high quality automated link network, so you should avoid using them because eventually, Google will locate the networks, and you will be penalized for the links you have got in the network. Along with reducing the off-page keyword density through Penguin, Google changed it’s rules for on-page keyword density too. Maximum keyword density on-page ought not exceed 2 to 3%. An easy way to aid your search engine rankings is to create a link from your content to an authority site from inside your site content. The best sites to link to are .gov and .edu sites. Good quality, well-written and genuinely unique content is the only content that you should publish on your site. Creating text links from keywords in your content to related content on other pages or to external sites is a good SEO practice. Videos and pictures are very useful content. Images are a great way to break up large sections of text and help to explain your content. Videos are ideal for increasing the time that visitors spend on your site. Using alt text behind each image is an opportunity to include a variation of a keyword rich description. Google can gauge the ‘reading age’ for your content and so can establish if it was created by a kid or a professor. For this reason, spell check all your content and be sure it is grammatically correct. Our studies have shown that there is a benefit in SERP’s for writing over 500 words of quality content. Make your content as compelling as possible. You will need your readers to find your site content useful and to spend time absorbing it. If real people like your content then you’ll rise in the search engine listings. Latent semantic indexing (LSI) is the process of keyword and phrase association that Google uses to relate similar meaning words together. This process means that you should use different words in your content and Google will still understand the topic and meaning. Unique meta data tags should be on each page of your website. You will be penalized in SERP’s if more than one page has the same metadata. A well-written and compelling meta description tag will boost the volume of clicks you receive from search engine traffic so write the best teaser description tags you can. Slow loading sites never show up in Google’s results so make sure that your site has a fast load speed, otherwise you won’t get the rankings you deserve. Maintain your bounce rate consistently below 55% for the best Google rankings. If too many of your website visitors hit the back button as soon as they arrive on your page then it indicates that your content isn’t ideal for the search traffic that Google is sending you. Increasing the average page views per visitor will improve your SERP’s rankings because Google uses average page views as an indicator of website content quality. The average time on site is an important metric for your quality score. The longer people spend on your web site, the better your rankings will probably be. These simple to follow SEO Tips will remove the barriers to top rankings that may be holding your site back in search. Collectively the add up to give you great traffic flows via search engines. If you are looking for help with your search engine optimization and need advice on what you should be doing to improve your website either on page, off page or both, read this local Hitchin business case study from Deeho, a Hitchin Web Design Agency, which covers everything you need to know. Good SEO just required the application of a specific set of quality controlled criteria to your pages and the links pointing at those pages. The key is knowing what you need to be doing.